Head injuries from auto accidents can cause long-term debilitation. They might not be apparent after the collision. 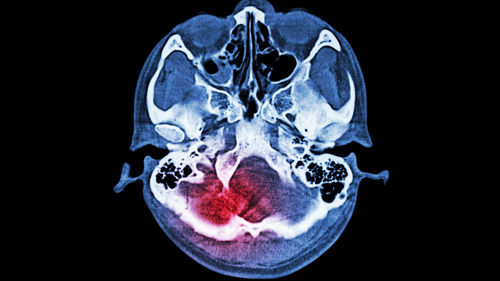 This makes brain injuries (TBI’s) some of the most dangerous types of injuries from collisions. This is true no matter what vehicle type. Seek immediate medical care at a hospital for an evaluation. Rosenfeld Injury Lawyers LLC works with clients who suffer head/brain injuries in motor vehicle crashes across Illinois. We understand how expensive caregiving and treatment are. The effects can last a lifetime. We aggressively pursue any avenue for recovery. You deserve every chance at compensation. What Causes Traumatic Brain Injuries in Auto Accidents? The brain is made up of three parts: the cerebrum, cerebellum, and the brain stem. The cerebrum is by far the largest. It is composed of two halves. It’s responsible for advanced body functions like speech and critical reasoning. The cerebellum is located underneath the cerebrum. It’s responsible for muscle movements like balance. Finally, the brain stem is the anchor of the brain. It connects the spinal cord to the other parts of the brain. It controls automatic functions like breathing. The skull wraps around the brain. It encases the entire organ. It acts as a protective shield. It’s composed of eight separate bones that are fused together. 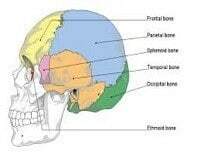 These bones include the frontal, sphenoid, occipital, ethmoid, two temporal bones, and two parietal bones. Both the brain and spinal cord are also covered with membranes called meninges. There are three layers of meninges called the pia, arachnoid, and dura. The dura is on the outside. The arachnoid is in the middle. The dura is the innermost level of meninges. Like the skull, they protect and contain other elements like blood vessels, subdural cavities. 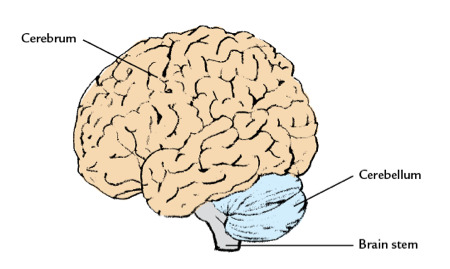 The cerebrum itself is divided into four parts/lobes. Those include the frontal, parietal, occipital, and temporal. The frontal lobe is responsible for speech, judgment and general intelligence. It’s in the front of the brain. The parietal lobe is for language, perception, and feeling emanate. It’s in the middle region of the brain. 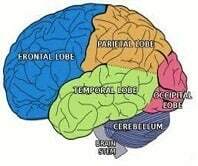 The occipital lobe is in the back of the brain. It’s responsible for sight. Finally, the temporal lobe is underneath the others. Hearing, memory, and organization come from this one. Here are a few diagrams to show the brain’s anatomy. Scientists are still learning what happens to the brain during an auto collision. Many injuries sustained in it are difficult to detect. Victims show no signs of symptoms until the damage has been done. Doctors must use extensive imaging tests to spot them. Below are some of the common causes of head trauma from these events. Our Chicago auto accident lawyers help them every day. Contact with a foreign or stationary object. Victims’ heads bang steering wheels, airbags, or the ground. Motorcyclists are especially at risk of these injuries. This is true because of the limited protection when riding their bikes. Forward momentum in an accident. The brain doesn’t need to hit a foreign object. It may strike the front or back of the skull. Brain matter is suspended within the skull. It can bounce around during sudden and rapid deceleration. This can result in internal swelling. Micro tears develop that are only detectable through imaging scans. Untreated concussions. It is important to properly look for concussions. These injuries can lead to serious complications if untreated. The initial symptoms can last mere minutes. That making them more difficult to detect. You might need further tests if the symptoms have passed quickly. Contact with the ground. Drivers are often thrown from their vehicles. They hit the ground in some matter. A helmet only offers a limited form of protection. It is important to see a doctor soon after these events. Initial symptoms of concussions can pass quickly. More symptoms can surface in the days and weeks after it. Our Chicago auto injury lawyers highly recommend seeking medical care immediately. Early detection and treatment of concussions and brain injuries are critical. They improve your long-term prognosis. Blackouts or loss of consciousness for any amount time. Blackouts can last only a couple of moments. They must still be treated with concern. Headaches with pressure inside the head. Some victims describe this like inflating a balloon within their heads. Sensitivity to noise and light. This is like what one would experience with a migraine. The inability to fall asleep. Excessive fatigue and weakness despite being fully rested. Loss of memory, confusion, disorientation or the inability to concentrate. Any loss of cognitive functions, whether for a brief time or ongoing should be documented. Seek medical attention right away. Sudden mood swings, irritability or excessive emotional reactions to everyday events. Numbness, tingling or loss of feeling in the hands, fingers, feet or toes. TBIs are linked to neurological disorders and degenerative brain diseases. There are very few ways to repair brain damage. Any damage suffered is permanent. Victims must find ways to cope with the complications. This results in the need for ongoing treatment. That comes with a prohibitive price tag. Anyone who has been in a car, accident has been through enough. They don’t need the financial pressure of a TBI. TBIs take away your ability to concentrate, recall past events, speak or communicate clearly. You can’t even perform motor functions well. They may require assistive care for the rest of their lives. This places a financial burden on them. It also requires a great deal from their families. Both suffer in dealing with this injury. Over 1,000,000 people suffer a TBI each year. Tens of thousands of people die from a TBI each year. Roughly 15% of TBIs result from motor vehicle accidents. The total cost of treating a TBI is roughly $1,000,000. Men receive TBIs twice as much as women. Defendants will have credible defenses to throw at you. Some of them work more than others. Ponder these as you formulate your plan of attack. It wasn’t their fault. This might be the most frequent argument. It’s referred to as contributory or comparative negligence. It’s exactly what they will charge you with. They’re alleging that it was your fault. They might say it was some other unrelated person or entity too. It was the doctor’s responsibility. These incidents are complex. They involve technical medical and factual issues. Defendants often blame the medical people who helped you. This includes doctors, nurses, etc. At the least, they will say the doctors made it worse. Thus, they should share in the blame. They should pay some of your damages. It’s not that big of a deal. This is a standard response in automobile accident lawsuits. Defendants try to show that you didn’t suffer as much as you say. Their main goal will be to reduce your intangible damages. There is not much they can do with your tangible damages. You can prove those much easier and without dispute. Rosenfeld Injury Lawyers LLC can help you recover after an auto accident. You might be entitled to large compensation under Illinois law. We have helped thousands of clients move forward. We connect them to qualified medical experts. We provide award-winning legal services. If you have been in an accident, contact us. We will arrange a free consultation with one of our qualified lawyers. Our team has a track record of helping people. We can provide you with legal options. This will build a case that recovers the compensation you deserve. Plus, we represent clients on contingency. This lets us help you even if you have no financial means. You don’t need to give us anything upfront. Our services are free of charge if we cannot secure compensation on your behalf.